I must have mentioned this several times, that I am normally not a very patient person. I think however, over time I have managed to hide this pretty well from most people. Years ago though, concealing my temper wasn’t something I did very well. On my recent holiday, we passed by California for the weekend to see my cousins and friends whom I hadn’t seen in over 10 years. As long lost friends always do, we spent a good chunk of time reminiscing over “the good old days”. One of the stories I couldn’t live down was the time my ex-boyfriend had broken up with me. I spent months (okay, maybe it was more like a year… and a bit…) agonizing and crying over one of my best friend’s shoulders. We would always chat long into the night and the funny thing is, I don’t think the essence of our conversations ever changed – it was either me asking him what had I done wrong, what I could have done different and him constantly reassuring me that “it was his loss”. Other times, I asked him to “analyze” for me the latest “ex-encounter” and whether his actions “meant anything”… reincarnations of these two topics came up over and over again… for a year… and a bit. During the trip, as we looked back on our University years, we laughed at how trivial everything seemed to us now, but at that time, I don’t know how I would have survived without his support. He always knew what to say when things were bleak, how to make me feel better, and how to make me laugh despite everything. So when a year or so after he and his own girlfriend broke up, of course I was there for him. I knew it was my turn to console him and do all the nice and altruistic things he had done for me. I lavished him with praises and told him that he was a sure ten and she was most likely a four (at best), I told him that for sure “he could do better”. The consoling continued well into the nights, just as he had done for me. That is, until one day, I had enough. I was frankly tired of iterations of similar conversations and so when he called me one night to tell me about her (again), I cracked it. I told him that I was tired of hearing about their break-up and “NO!” they were probably not going to get back together and “NO!” just because she said “Hi!” it didn’t mean that she liked him all over again. I said that he should forget about her and move on. I mean, seriously, enough was enough! My outburst was met with silence. “Trissa,” he said. “For ONE YEAR, I was there for you when your relationship ended. I listened to you talk about your ex, I was there to give you advice, be there for you, keep you company and just be a really good friend!” he declared. “And you can’t even give me two weeks?! ?” he asked. I must have also mentioned many times that my impatience does NOT extend to food. With food I am willing to wait. Take these beef ribs I cooked using the latest addition to my kitchen gadgets, a sous vide machine. I cooked them for three straight days. I would come home after each day and take a sneak peak at the ribs bathing in the machine, smiling at myself knowing that there was something amazing waiting for me at the end. Sous vide is a technique wherein food is first vacuum sealed and then submerged into a water bath and cooked over a low, precise temperature. The machine, made popular by the likes of Heston Blumenthal, is hands down one of the best kitchen investments I have made. I have tried cooking rack of lamb, chicken, slow poached eggs and most recently, these 72 hour beef ribs which was inspired by a meal I had at Izakaya Fujiyama. I tried asking Chef Kenji for the beef ribs recipe but he said it was a secret but I think my recipe comes dangerously close to it. The beef is so tender but still beautifully pink in the middle. It is unlike anything I’ve ever tasted. Restaurant quality food at home, and anyone can make it. Unbelievable! Prepare the brine by dissolving the salt and sugar in 3 liters of water. Add the beef ribs and leave for one to two hours. Remove and pat dry with paper towels. Prepare the water bath, fill it with water and bring the temperature to 56c. Place each portion into the sous vide bag and vacuum seal. Place the beef ribs in the water bath and cook for 72 hours. When done, remove the beef ribs. If not using immediately, place the beef ribs in a container filled with 50% ice and 50% water. Cool the ribs then store in the refrigerator until required (if using from the refrigerator, heat at 56c for 15 minutes before using. Heat a few tablespoons of vegetable oil in a pan until almost smoking (the pan should be very hot), quickly sear the beef on all sides, around 30 seconds to 1 minute each side until golden brown. 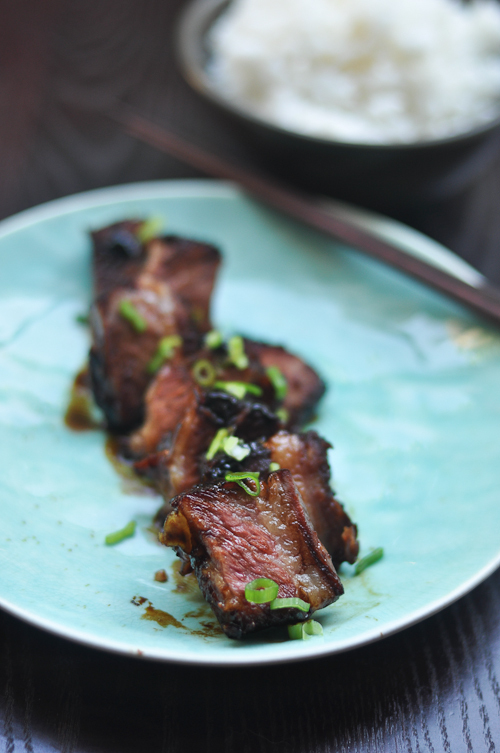 Coat the beef in the teriyaki glaze (recipe follows). Slice and serve with green onions (optional). Mix the mirin, sake and dark soy sauce in a sauce pan. Bring the ingredients to a boil and then turn down to a simmer until the sauce thickens, around 10 minutes. In another sauce pan, combine the ginger, garlic, and chili and oil and cook over a low heat until fragrant. You stories never cease to crack me up! LOL! Trissa, I’m the opposite. I could never wait for food! Ok…maybe an exception in this case as I know how wonderful your sous vide machine and technique is. Glad to see someone else blogging about sous-vide, there aren’t that many of us! 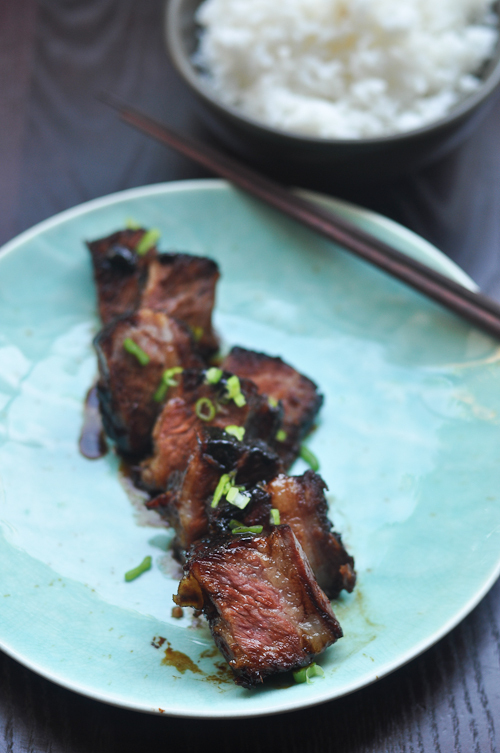 I recently made something very similar (http://stefangourmet.com/2012/05/15/beef-short-ribs-teriyaki-sous-vide/) and notice that you brine rather than cook with the teriyaki marinade like I did. My meat did turn out a bit dry, is that why you marinate with a sugar/salt brine rather than with teriyaki marinade? I desperately, desperately, desperately want, no, need a sous vide machine. A beautiful, shiny one sits in the college kitchens but because it can’t be cleared by health and safety for use in the college yet all we can do is stare at it with longing. I hope next year at “proper cookery school” I’ll get to play around with as many gadgets as I want to to my hearts content! I am extortionately envious of your array of kitchen gadgets and next time you have to clear out the garage (from what I remember, that’s where you have to keep your overflow) sell things here and you’ll make a killing! What a simple yet delicious recipe! I’ll have to assemble my machine (not possible to leave it on the counter) and try this. Looking forward to more sous vide recipes.